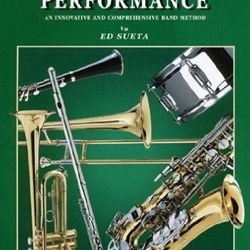 Premier Performance is an innovative and comprehensive band method written with one primary goal: providing band directors with the most effective and logically sequenced instructional materials for young instrumentalists. Premier Performance® is carefully structured to develop the three cornerstones of outstanding musicianship: superior tone quality, accurate rhythm reading skills and technical facility. Strong emphasis is placed on rhythmic development since this may be the greatest challenge facing first and second year students.